The basic navigation is simple and easy. All of the main options are right on the main menu. The amount of time it takes to download the Demo is average (or a little bit faster). The opening credits are average length. The menu options are large, with an easy to read font that takes up more than enough space for easy tapping. The accuracy of the touch screen is spot on. The game's basic controls are simple: drive with the Direction Pad, press "A" to jump/fly higher, press "B" to shoot a firecracker, and press "L" to use an item. The touch screen is not involved in any actual gamepley. That being said, the vehicles don't always respond exactly as they're expected to. The vehicles will turn right away, but the direction of movement takes time to react. Navigating around the landscape can be hindering and can slowplayers down, more so than they might expect. It's not detrimental, but it's enough to be noticed and can take a lot of getting used to. Graphically, the game is made of super-bright colors and shapes. While some of the darker colors make an appearance, they're few and far between. Almost every graphic in the game is constantly animated (characters, background, etc.). This can be helpful, but it can also be a major problem. Looking to spot other human or computer characters by seeking out movement isn't a possibility. Audibly, the soundtrack is pleasant and upbeat. It helps to set the mood, but doesn't add to the gameplay. The sound effects, on the other hand, DO add to the gameplay, alerting players to everything from a flag being captured to a shot firecracker hitting a vehicle. Getting pushed several vehicle-lengths sideways makes more sense when a player knows they've been shot. There are many features to choose from, ranging from game type to planet, character, and team size. 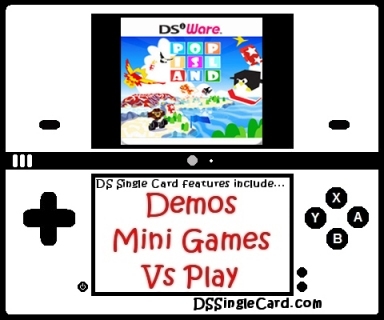 Pop Island was the first downloadable-only DSiWare title to feature Single-Card Download play (not counting the Clubhouse Games collections, which are also available on a physical DS chip). The game features a full-play demo, as well as multiplayer with the host. The game is, as they say, very saccharine - sugary and sweet. It's all happiness and kindness and stuff. Is that a bad thing? No. Will it put some players off? Yes. It doesn't bother me personally - the first aspect I look at in a game is gameplay, and Pop Island is fun. It's extremely inexpensive, available to purchase at a moment's notice, and features some great multiplayer. Is it perfect? No, it's not, but it's more than worth the price and it is a great pick-up game when you and some friends have a few minutes with notheing to do. Besides, with the game being as "sugary" and "kind" as it is, it makes downright nasty smack talk all the sweeter (sorry). Tighten up the steering, or at least offer several driving options. Increase the number of vehicles; have different vehicles take driving obstacles (hills, etc.) differently. Click here to return to the DSSingleCard.com Pop Island profile.